The weather did me a favour this weekend on two accounts. Firstly, it offered the perfect excuse opportunity to sit (guilt-free) on the sofa watching the excellent Diamond Jubilee programming on TV. I learned so much about the Queen, not just as Monarch but as a woman and mother. As a mum of two I found a deep respect for the newly-wed parent of two pre-schoolers who, in her mid twenties, suddenly found herself as Monarch and Head of the Commonwealth. I loved the family footage of her playing with the children and being a mum, hearing how she and the Duke made bedtime an important part of their daily routine and how they tried to have as "normal" a family life as possible within the obvious constraints. The thing that really struck me, was the loving home that the Queen was part of when she was growing up and how she has strived to do the same for her own family. I also realised just how much she has relied on her husband over the years and their obvious love and respect for each other is very touching after so long together. I hope he makes a speedy recovery from the infection that hospitalised him yesterday. If you've been following the June Shawl Knitalong you may have already seen my progress, which has been the other unexpected benefit of wet weather and cancelled plans. The pattern is really great, although I'm working a few modifications - KFB in place of M1, YO between the first 2 sts which is dropped on the next row, and a few rows less on the section with 3 colour stripes. Last night I found myself just a few rows from the end of the stripe section and about to use the last of my ball of ecru. 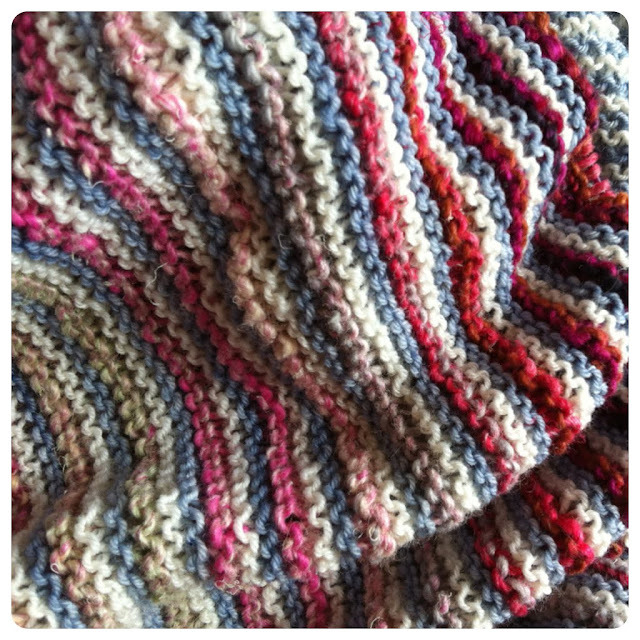 The prior Noro stripe had been the dark colour I'd hoped to have at the end of the striped section....so I decided to skip the last few stripes and move onto the border (which I may make a little longer than in the pattern) and save the other ball of ecru for a second shawl. Despite the yarn over modification, the tension along the edge is still a little off, which I think is due to twisting the colours up the side of the work - next time I would probably not twist, but let them do their own thing. I had expected this shawl to take a few weeks as I usually only knit in the evening for an hour or so, but the extra time around the house over the bank holidays has meant it's been flying off the needles. I still have no idea how this is going to look when it's off those needles as I'm knitting on an 80cm cable and it's very scrunched up, but I do love the colours. I'm already planning another in navy, ecru and Spectrum rainbow yarn which I am waiting to be delivered from the Yarn Yard. 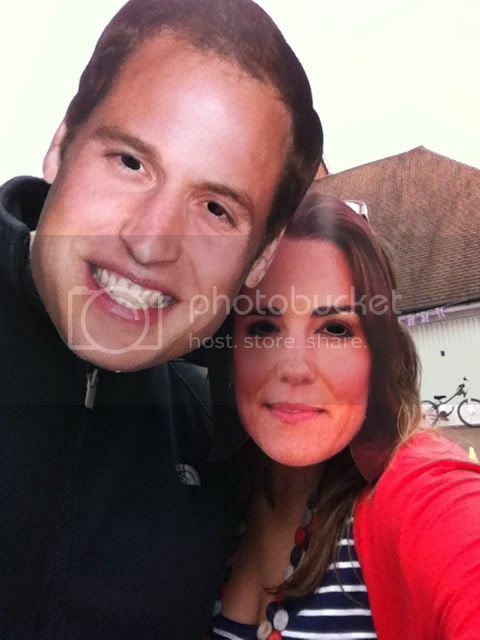 Today, in typical British fashion, we had our Jubilee street party in the rain. It started off a little chilly and overcast, but within a couple of hours the rain was battering down against the plastic marquee and we all resorted to winter coats. It didn't dampen our spirits - we had good company and plenty to eat and drink. The children were not as crazy as us and all retreated into one of the houses to watch a DVD, but they are young and have not yet learned that standing or sitting in the cold and rain is part of our British tradition, nay, character. If you would like to share your Shawl progress with us, please use the link below to enter the URL of your blog post, photohost or even your Ravelry notes, if that's the place you are recording it. You can also view the Instagram gallery online via this link. i'm super happy with how my color affection shawl is coming along, so thanks a million for hosting this knitalong - i'd probably not have chosen this pattern if it weren't for the knitalong, and it simply is too good to miss out on! I think this queen is so popular because of her longevity - her reign has seen 12 different Prime Ministers, starting way back with Winston Churchill so she has lots of experience and has been a constant for several generations of Brits now. The shawl is now finished (this morning) but it needs blocking before I show you so that'll be on Friday. Glad you're enjoying it - yours looks lovely! Beautiful! I can't wait to see what it looks like when its all done! Thanks. I'm pleased with the colours. What interesting tidbits about the Queen. I hope her husband recovers quickly. Can't wait to see the full effect of your shawl. Sounds like you managed to have fun, even in the rain! And the shawl is looking lovely. The shawl looks great, I know what you mean about not knowing what it will look like when it's all scrunched up, I've been moaning about the same thing, I can't wait to see it off the needles. Glad that despite the rain you have enjoyed the jubilee celebrations, there's a lot to be said for the Brit character of being able to stand in the drizzle and wind, holding down paper plates and cups, eating cucumber sandwiches drinking pimms all the while smiling! It is so wide off the needles!!!! You are spot on about the party! I can't wait to see your ta da post, I love the colours you've used. Just added my link - a bit late starting but racing along to catch everyone else up !